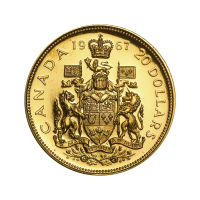 1967 عملات ذهبية خاصة بالذكرى المئوية لدار السك الكندية Add some vintage value to your collection today with the purchase of a 1967 Royal Canadian Mint Centennial gold coin, for the best value online. This coin is .900 pure gold. The obverse boasts a portrait of Queen Elizabeth II The reverse displays the Canadian coat of arms, the year and 20 dollar denomination. Included on the reverse coat of arms is the Latin motto "a mari usque ad mare" which translates "From sea to sea". A plastic capsule is included with your purchase of a 1967 Centennial gold coin to further preserve this beautiful piece of history. Be a part of the centennial celebration and add vintage value to your collection today.